4-Word Review: Bounty hunter tracks revolutionary. 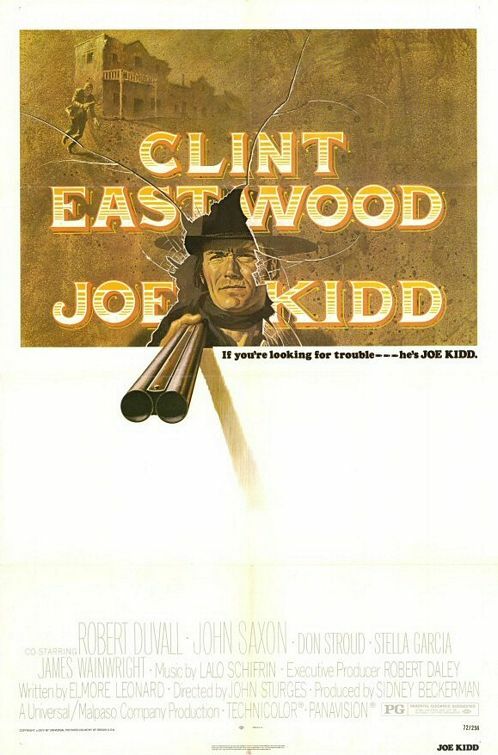 Joe Kidd (Clint Eastwood) is a bounty hunter sitting in jail on trumped up charges. As he is about to have his case heard the courthouse is invaded by Luis Chama (John Saxon) and his band of Mexican revolutionaries who are angered that their U.S. land claims have been denied. They threaten a full scale war against the American government and suddenly Kidd finds himself in the middle when powerful landowner Frank Harlan (Robert Duvall) wants to use Kidd’s abilities to track Chama down so that he can kill him before he can ferment any more unrest. Kidd and Frank do not like each other, but Kidd reluctantly goes along while planning at some point to stop Frank and his men before they can do anymore harm. If there is one thing to take from this film it is Duvall’s performance. This is the movie where he really came into his own and his career transitioned from small character parts and guest spots in TV-shows to an all-around dynamic lead actor. His presence here is commanding and he plays the bad guy with such zeal that it ends up taking over the entire picture while smothering the usually reliable Eastwood until he and his character become bland and transparent. Unfortunately the script written by Elmore Leonard cannot match the same energy or creativity. It starts out well and has all the rugged ingredients one expects from a good western and it’s even directed by John Sturges who’s noted for putting together great action flicks, but unfortunately at some point it goes flat and this is mainly because there is not much of a second or third act. The scenario itself is too predictable and gets played out in a mechanical, by-the-numbers fashion. It is also devoid of much action. The part where Kidd uses his telescope rifle to pick off a shooter at long range that the others can’t is okay, but the scene where he derails a train and sends it crashing through a saloon seems implausible and not as exciting to see as it may sound. I enjoyed Kidd’s antagonistic relationship with Lamarr (Don Stroud) who is one of Harlan’s men and a young, long haired cocksure guy that immediately gets a vendetta against the more stoic Kidd, which adds some zest, but then the film squashes it too soon by having Kidd kill Lamarr in a rather unimaginative and uneventful way. In fact the whole climactic finish works in the same way with Kidd mechanically knocking off each of Harlan’s men in a fashion similar to what Gary Cooper did to the bad guys in High Noon, which was a far better movie. Kidd’s final shootout with Harlan is a particular letdown and should’ve been played out more while only helping to cement this as one of Eastwood’s weakest and more forgettable westerns that he has done. This entry was posted in 70's Movies, Movies with a rural setting, Westerns and tagged Clint Eastwood, Don Stroud, Elmore Leonard, Entertainment, John Saxon, John Sturges, Movies, Review, Robert Duvall. Bookmark the permalink.